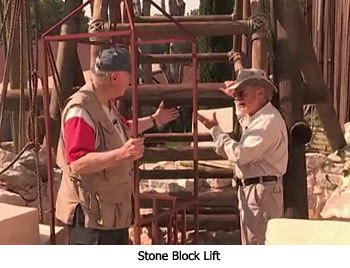 How were the huge Temple stones lifted? Dr. Fleming: We made a rock quarry here in the mountainside which we are cutting away. There are pieces of wood in spaces between the cuts so you can pour water on it. You pour water on the wood and then by utilizing osmosis the water makes the wood expand causing the release of the blocks. 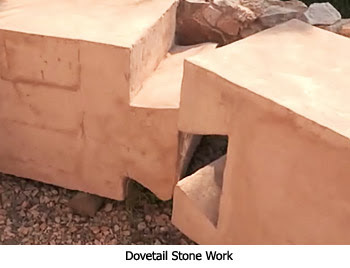 I have an example of a kind of stone work called dovetail which allows the blocks to fit together like jig-saw puzzle pieces. There is actually a picture of a wall hanging in the back made with cut stones. If you're on a lose foundation or a swamp, you can be sure the stones are locked together. Paul used this when he talked about the Church being stones rightly joined together adding strength to one another. People often ask, "How did they lift up such heavy stones?" Dr. Reagan: Okay then, Jim, how in the world did they ever move the huge stones? Dr. Fleming: The answer is... very slowly. No, no, sorry. Just kidding. They used a walk-in-wheel. It's amazing that in 500 BC the Greeks learned if you make a rope go around a pulley it reduces by 1/4 the weight of the other side of the pulley. You start then with one pulley up at the top, then the rope comes down to a second and a third pulley and finally back again. Believe it or not, with just a few pulleys one can lift nearly 1,000 pounds. To work these pulleys the people would walk inside big wheels, winding the rope up. I have one picture of five people walking in such a wheel lifting up a huge stone. Think about Herod's Temple being 200 feet high. The builders used a series of tripods, quadripods and pulleys. They certainly weren't dumb. Dr. Reagan: No, they certainly weren't. They knew a little bit about engineering, didn't they? Dr. Fleming: Yes, indeed. Remember in Luke 21 as Jesus and His disciples left the Temple, some of his disciples commented to Jesus, "Have you ever seen such beautiful stones or magnificent buildings?" But, Jesus had to remind them that all of that magnificence was going to come to an end. Not one stone would be left on top of the other. But, their comment shows how much they were impressed with the engineering of these imperial building projects. 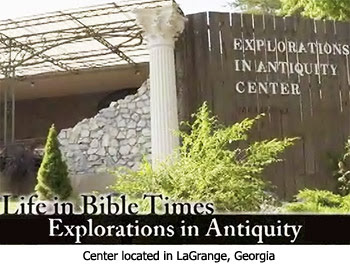 In the fifth part of this series with archaeologist Dr. James Fleming at his Explorations in Antiquity Center, we'll glean some biblical insights by learning what life in the First Century was like when it came to grape and olive harvesting time. Is this from a DVD that can be ordered? I sure hope so!! I set my alarm to watch the rerun at 3 in the morning it was sooo awesome! My favorite goodies from l&l are his israel teachings. Three in the morning, Susie?!? Click the TV icon at the top of the article and you can watch the show at any time. Wow, though, so good to hear the show's been a blessing. As for DVD, I hope so, but haven't heard anything about an album in the works as of yet. Well nathan.. i only have my lil phone.. no computer... so its not real easy to do that. But it is an excellent series. "Christ in Prophecy" episodes are available for watching under the Media tab on the Lamb & Lion App. Nathan, i downloaded ur app.. looks great! But.. when i go to the blog part, it doesnt let u comment... is there something im missing?? I called L&L when I posted my comment (but have been away). The program is available on DVD for $5.00 per episode. Apparently this series is a four parter. Only the first 2 parts were available on DVD for now so I'm waiting until they are all out to order them. I know I can watch online but I prefer to watch it on TV.